Russian Orthodox icon of the Prophet Micah, 18th century (Iconostasis of Transfiguration Church, Kizhi Monastery, Karelia, Russia). Micah, (Hebrew: מִיכָיָ֫הוּ Mikayahu) whose name means "who is like Yah", was a prophet in Judaism who prophesied from approximately 737 to 696 BC in Judah and is the author of the Book of Micah. 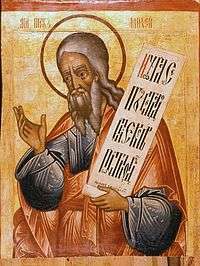 He is considered one of the twelve minor prophets of the Tanakh (Hebrew Bible) and was a contemporary of the prophets Isaiah, Amos and Hosea. Micah was from Moresheth-Gath, in southwest Judah. He prophesied during the reigns of kings Jotham, Ahaz, and Hezekiah of Judah. Micah’s messages were directed chiefly toward Jerusalem. He prophesied the future destruction of Jerusalem and Samaria, the destruction and then future restoration of the Judean state, and he rebuked the people of Judah for dishonesty and idolatry. His prophecy that the Messiah would be born in the town of Bethlehem is cited in the Gospel of Matthew. Information about the end of his life is not known. Micah was active in Judah from before the fall of Samaria in 722 BC and experienced the devastation brought by Sennacherib’s invasion of Judah in 701 BC. He prophesied from approximately 737–696 BC. Micah was from Moresheth, also called Moresheth-Gath, a small town in southwest Judah. Micah lived in a rural area, but often rebuked the corruption of city life in Israel and Judah. Micah prophesied during the reigns of kings Jotham, Ahaz, and Hezekiah of Judah. Jotham, the son of Uzziah, was king of Judah from 742–735 BC. Jotham was succeeded by his son Ahaz, who reigned over Judah from 735–715 BC. Then Ahaz’s son Hezekiah ruled from 715–696 BC. Micah was a contemporary of the prophets Isaiah, Amos, and Hosea. Jeremiah, who prophesied about thirty years after Micah, recognized Micah as a prophet from Moresheth who prophesied during the reign of Hezekiah. His messages were directed mainly towards Jerusalem, and were a mixture of denunciations and prophecies. In his early prophecies, he predicted the destruction of both Samaria and Jerusalem for their respective sins. The people of Samaria were rebuked for worshipping idols which were bought with the income earned by prostitutes. Micah was the first prophet to predict the downfall of Jerusalem. According to him, the city was doomed because its beautification was financed by dishonest business practices, which impoverished the city’s citizens. He also called to account the prophets of his day, whom he accused of accepting money for their oracles. Micah also anticipated the destruction of the Judean state and promised its restoration more glorious than before. He prophesied an era of universal peace over which the Governor will rule from Jerusalem. Micah also declared that when the glory of Zion and Jacob is restored that the LORD will force the Gentiles to abandon idolatry. Israel’s response to Micah’s charges and threats consisted of three parts: an admission of guilt, a warning of adversaries that Israel will rely on the LORD for deliverance and forgiveness, and a prayer for forgiveness and deliverance. Another prophecy given by Micah details the future destruction of Jerusalem and the plowing of Zion (a part of Jerusalem). This passage (Micah 3:11–12), is stated again in Jeremiah 26:18, Micah’s only prophecy repeated in the Old Testament. Since then Jerusalem has been destroyed three times, the first one being the fulfillment of Micah’s prophecy. The Babylonians destroyed Jerusalem in 586 BC, about 150 years after Micah gave this prophecy. 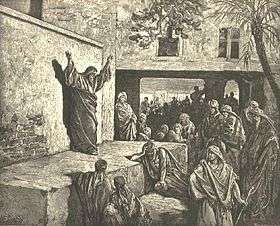 Engraving of the Prophet Micah by Gustave Doré. Micah 5:2 is interpreted as a prophecy that Bethlehem, a small village just south of Jerusalem, would be the birthplace of the Messiah. This passage is recalled in Matthew 2:6, and the fulfillment of this prophecy in the birth of Jesus is further described in Matthew 2:1–6. Micah was referring to the division in Judah and Samaria, the distrust that had arisen between all citizens, even within families. Jesus was using the same words to describe something different. Jesus said that he did not come to bring peace, but to divide households. Men are commanded to love Jesus Christ more than their own family members, and Jesus indicated that this priority would lead to persecution from others and separation within families. In Micah 7:20, Micah reminded Judah of God’s covenant to be merciful to Jacob and show love to Abraham and his descendants. This is repeated in Luke 1:72–73 in the prophecy Zechariah at the circumcision and naming of John the Baptist. This prophecy concerned the kingdom and salvation through the Messiah. It is a step in the fulfillment of the blessing of the descendants of Abraham. When Micah restated this covenant promise, he was comforting Judah with the promise of God’s faithfulness and love. Micah is commemorated with the other minor prophets in the Calendar of Saints (Armenian Apostolic Church) on July 31. In the Eastern Orthodox Church he is commemorated twice in the year. 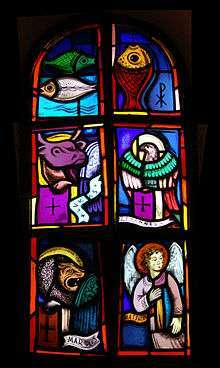 The first feast day is January 5 (for those churches which follow the traditional Julian Calendar, January 5 currently falls on January 18 of the modern Gregorian Calendar). However, since January 5 is also the eve of the Great Feast of Theophany (in the west, Epiphany) and a strict fast day (near total abstinence from food and non-religious activities), his major celebration is on August 14 (the forefeast of the Great Feast of the Dormition of the Mother of God). ↑ Powell, Mark Allan (2011). Book of Micah. HarperCollins Bible Dictionary – Revised & Updated. HarperCollins. p. PT995. ISBN 0062078593. Retrieved 24 June 2013. ↑ "Micah, Book of", New Bible Dictionary, Second Edition, Tyndale Press, 1987 p. 772–773. ↑ Jeremiah 26:18; Jeremiah 26. Henry, Matthew. Matthew Henry’s Concise Commentary on the Whole Bible. Thomas Nelson Publishers, 2000. Page 589. ↑ Micah 1:7; "Micah, Book of", The Illustrated Dictionary and Concordance of the Bible, The Jerusalem Publishing House, Ltd., 1986. p. 688–689. ↑ Micah 3:5–6; "Micah", New Bible Dictionary, Second Edition, Tyndale Press, 1987 p. 772. ↑ Micah 5:10–15; "Micah, Book of", The Illustrated Dictionary and Concordance of the Bible, The Jerusalem Publishing House, Ltd., 1986. p. 688–689. ↑ Micah 7:1–6; Micah: A Commentary. Mays, James Luther. Old Testament Library. Westminster John Knox Press, 1976. ISBN 978-0-664-20817-2. p. 131–133. ↑ Micah 7:7–13; Micah, a translation with notes from J. Sharpe. Micah (the prophet), ed. John Sharpe. 1876. Oxford University Press. 1 2 Micah: A Commentary. Mays, James Luther. Old Testament Library. Westminster John Knox Press, 1976. ISBN 978-0-664-20817-2. p. 131–133. 1 2 Matthew 10. Henry, Matthew. Matthew Henry’s Concise Commentary on the Whole Bible. Thomas Nelson Publishers, 2000. Page 381. ↑ Micah 7. The Holy Bible, containing the Old and New Testaments…with commentary and notes by Adam Clarke. Clarke, Adam. Columbia University, 1833. p. 347. Delbert R. Hillers, Micah (Minneapolis, Fortress Press, 1984) (Nurse).